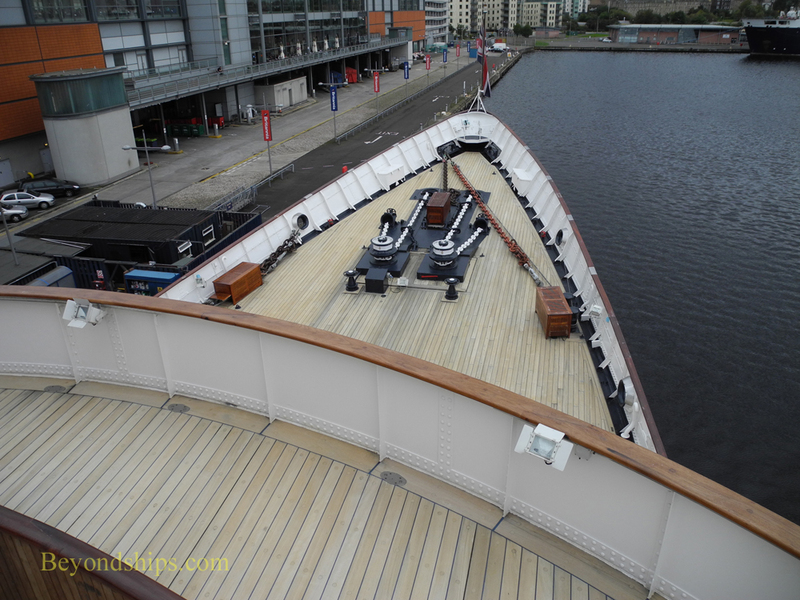 The Royal Yacht Britannia has become one of Scotland's most popular attractions. It is rightfully on most visitor's list of things to see while in Edinburgh. But what is Britannia's appeal? Although she was a residence of a reigning monarch for some 44 years, she is not a particularly grand or luxurious ship. There are no great works of art aboard or impressive state rooms to awe the visitor. Rather, she has the appearance and feel of a very nice, comfortable, mid-20th century, upper-class country home gone to sea. She was involved in several historic events. She was on hand for the opening of the St. Lawrence Seaway in 1959 and there when Britain handed over Hong Kong to China in 1997. However, it seems unlikely that her connection to these events is what draws the crowds. Rather, I believe it is her connection to a very popular monarch Britain's Queen Elizabeth II. Unlike other royal residences such as Buckingham Palace and Windsor Castle, Elizabeth II was the only monarch to occupy Britannia. Moreover, for decades, the public saw images of the Queen on Britannia and so in the minds of many of us, Britannia is very much her ship. A visit to Britannia does not disappoint. Unlike many historic ships that have been turned into museums, Britannia did not go through a long period of being laid up. Consequently, her furnishings and artifacts did not become dispersed. Some 95 percent of the items you see were aboard when the ship was in service. Thus, walking around Britannia, you do get a feel for the people who lived there. This is true not just of the Royal Family but for the Sailors (called “Yachtsmen”) and Marines who operated the ship. There have been some 83 royal yachts since the restoration of the monarchy in 1660. These ships were pleasure craft and lacked full ocean-going capability. Prior to Britannia, all but one of the royal yachts were sailing ships. That ship was the Victoria and Albert III. It was built for Queen Victoria but never used by her. However, her son, Edward VII, and the next two monarchs sailed the vessel. With war clouds looming over Europe, the old ship was retired in 1939. After the Second World War, it was decided to build a new royal yacht but one that was different than those that had gone before. It would have full ocean-going capability and thus could be used to transport the monarch and the Royal Family on foreign visits, particularly to the numerous Commonwealth countries that were then gaining independence. In addition, the yacht would allow the monarch to host receptions and banquets during visits to foreign nations on what was officially British territory. Furthermore, the yacht would be built so that it could be converted into a military hospital ship during times of war. King George VI agreed to this plan and an order was placed to build the ship. Unfortunately, George VI died shortly after the order was placed. As a result, the new monarch, Queen Elizabeth II oversaw the construction and development of the new yacht virtually from the beginning. 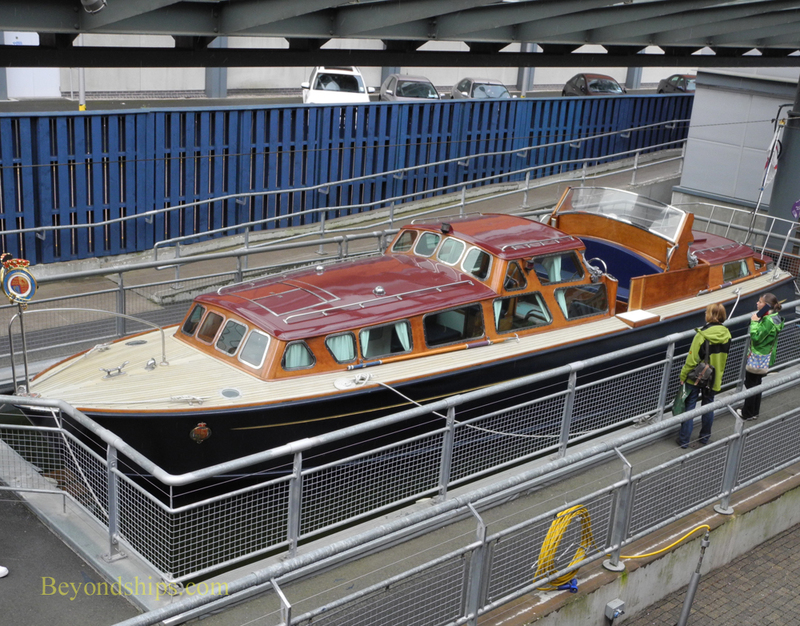 The shipyard selected to build the new yacht was John Brown & Co. located in Clydebank, Scotland. This was the same shipyard that had built the original Queen Mary and Queen Elizabeth ocean liners and which would later build the Queen Elizabeth 2 (QE2). She waslaid down in JUne 1952, launched and named by the Queen on 14 April 1953 and was commissioned into the Royal Navy on 11 January 1954. Britannia was somewhat conservative in design. She was steam driven and she was one of the last ships to have a riveted hull (disguised by a coating that makes the hull appear smooth). Touring her, I was surprised by how much of the original technology remained. 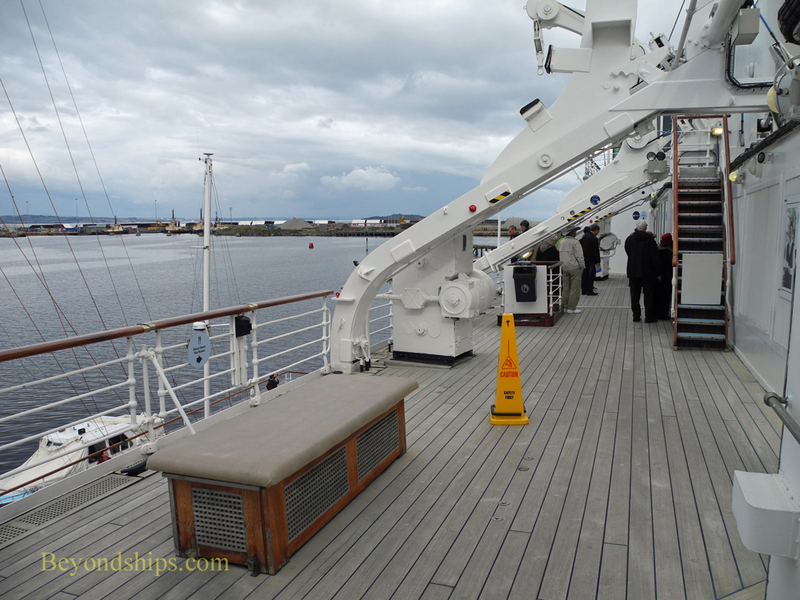 The Queen was not on Britannia's maiden voyage in April 1954. Instead, the passengers were the young Princess Charles and Princess Anne who were being taken out to North Africa to join their parents who were on a Commonwealth tour. During the next 44 years, the Queen and other members of the Royal Family made extensive use of the yacht in the course of their official duties. Britannia was used on 696 foreign visits and 272 visits in British waters. 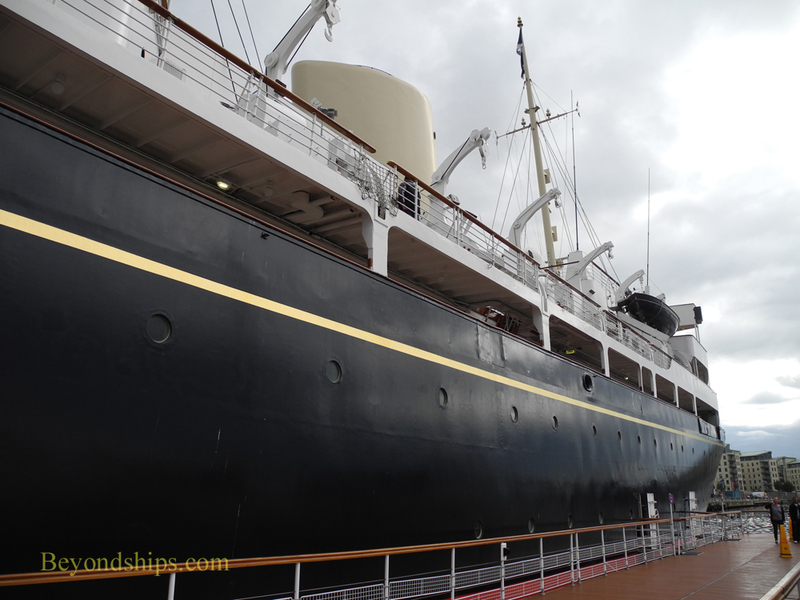 Among others four Presidents of the United States were received aboard Britannia. With the coming of the jet age, Britannia's role as a means of transportation diminished. However, she continued to act as a mobile royal residence during foreign visits. Instead of sailing on Britannia, the Queen would fly to the foreign country and meet Britannia there. The yacht would then serve as her base of operations during the visit. When the visit was over, the Queen would fly home and Britannia would sail home. Since sailing generally takes more time than flying, this arrangement would allow the Queen to make more efficient use of her time. The Royal Family were not the only ones to use the yacht. Britannia was used to support British trade missions with “Sea Days” during which foreign business people being invited to events held on board. There they would meet with British businessmen and officials. It has been estimated that this resulted in billions of pounds in contracts for British business. Britannia was not used exclusively for official duties. It was often seen off the Isle of Wight during Cowes Week reflecting the Royal Family's passion for sail boat racing. Also in the summer, the Royal Family would take Britannia on a vacation cruise around the Western Isles of Scotland. The yacht was used as well during four royal honeymoons. The ship was never used as a hospital ship. However, in 1986, it was used to evacuate more than 1,000 people during the civil war in South Yeman. Part of the evacuation was done under fire. By the late 1990s, Britannia was nearing the end of her service life. John Major's Conservative government promised that it would build a successor. However, after the 1997 election, Tony Blair's Labour government announced that there would be no replacement and no attempt to extend the life of Britannia. In a ceremony attended by the Queen and the senior members of the Royal Family, Britannia was decommissioned on 11 December 1997. The yacht had steamed over one million miles in her service career. Meanwhile a competition had begun among a number of British ports to become the home for the retired Britannia. That competition was won by Edinburgh, which proposed to use the ship in the revitalization of the historic port of Leith. 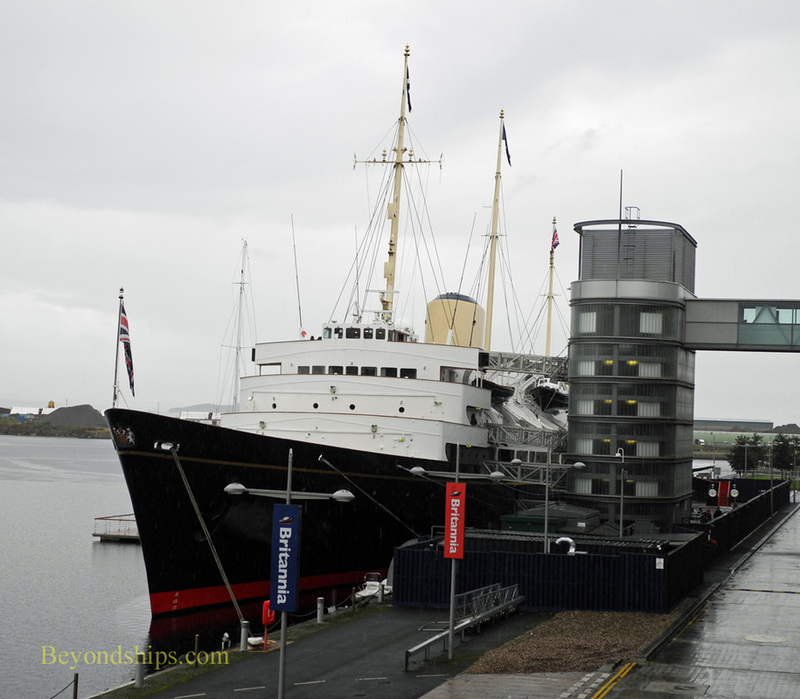 Therefore, on 29 April 1998, ownership was transferred from the Ministry of Defense to the present owners, The Royal Yacht Britannia Trust, and the ship was brought to Edinburgh, opening to the public in October 1998. Britannia is moored at the Ocean Terminal in the Port of Leith. Most cruise ships calling in Edinburgh offer a shore excursion to Britannia, often combined with a visit to Holyrood House or Edinburgh Castle. However, it is also possible to visit independently. It is about two miles from the city center and you can get there by bus or taxi. The Ocean Terminal is essentially a large shopping mall. It has many different types of shops inside along with various eateries. Once inside, you follow the signs to the entrance to the ship. According to the operators, it is usually not necessary to book tickets in advance except in August when the Edinburgh festival takes place. Included in the admission price is an audio tour. Photography is permitted. 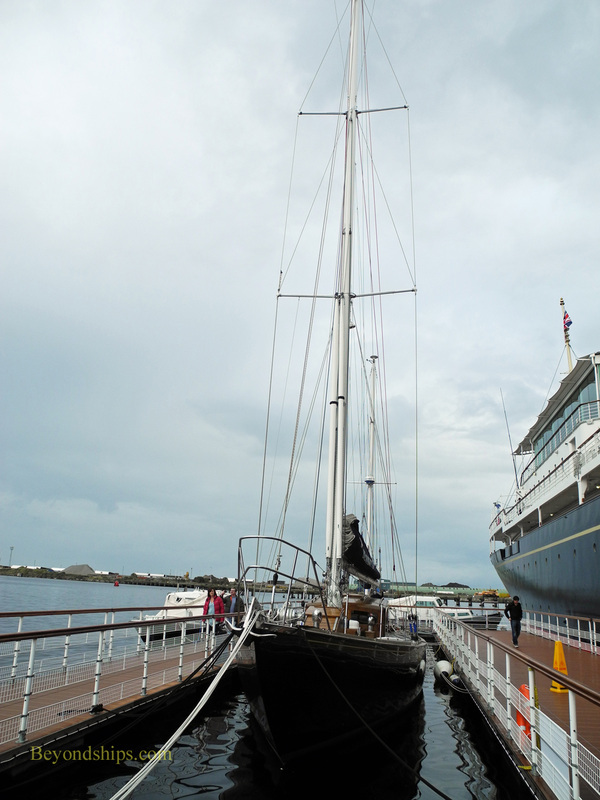 Also on exhibit with Britannia are Bloodhound (above), a sailing yacht once owned by the Queen and the Royal Barge (left), which acted as a tender to Britannia, ferrying the Royal Family ashore when the yacht was at anchor.